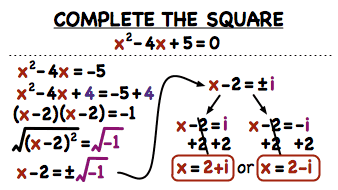 You can solve a quadratic equation by completing the square! This tutorial shows you the steps needed to solve a quadratic using this method. The vertex form of a quadratic equation can help you quickly identify the vertex of that quadratic. Follow along with this tutorial to see how to use the completing the square method to change a quadratic equation from standard form to vertex form! You can change a quadratic equation from standard form to vertex form by completing the square! This tutorial takes you through the process step-by-step. You can never get too much practice working with the quadratic formula, especially when the solution includes complex numbers! Watch this tutorial to see the quadratic formula be used to find the complex solutions to a quadratic equation.